In the northwest of Bulgaria, just 100 kilometers away from Sofia, up in the Balkan, lies a magical place where imagination can run wild and nature's seemingly random forms take familiar faces and shapes. Turn after turn up the mountain road marvelous views open before our eyes, but there can't be too much looking around, for the winding path is a challenge to drivers even in the summer. When it seems that you have made over 100 turns since you left Vratsa, you finally see the road fork out, take the right and you are heading towards one of Bulgaria's real pearls. Hidden well into the mountain like a pearl in the oyster, and continuing to grow in beauty by each day, and each added drop of water, the Ledenika mountain is one of the must-see places in Bulgaria. With the added bonus that you may get a wish fulfilled, and be cleansed of all your sins. Entering the cave you walk into the Antechamber, the lowest part of the cave that gave its name (led meaning ice in Bulgarian) for in the winter and spring it is adorned with a captivating ice trimming that is unique every single time you drop by. ... you are about to be tested. Only the purest of souls can pass through the next narrow passage, the legend says, and that is why it is called sinners' passage. But God must be lenient, for I have never seen anyone get stuck in it in all five times I have visited the Ledenika cave. So open your heart, cleanse your soul and enter the Concert Hall - the cave's largest and most impressive hall, where fairytale characters live along real creatures, all in stone. Here you can see the Crocodile hanging from the ceiling, the Giant's Head, Santa Claus, and many more. 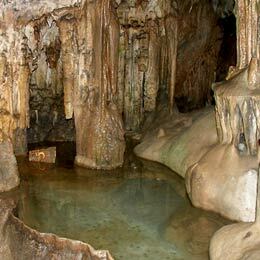 Unleash your imagination here and look at the stalactites and stalagmites with a new vision. Discover former communist chief Todor Zhivkov, a big mushroom, a falcon, a smiling face - he only boundaries here are the ones you set for yourself. And if you are lucky enough you may even have the chance to enjoy the purest of sounds, for the hall's name is by all means not chosen randomly. Acoustics here are amazing and on rare occasions local classical orchestras gather to play a piece. The concert cannot be too long for the 92% humidity in the cave is bad for the instruments, but those fifteen minutes filled with music the way it was meant to be heard, among the gorgeous formations of nature are a true moment of enlightenment. Don't forget to turn slightly to the right and enter a small, shrine-like room, where a shallow lake can make your wish come true if you believe hard enough. And after you are done wishing take the metal bridges over the Big and the Small Crevasses and through the Curtains corridor into the White hall. Here you can see some more of nature's exquisite sculptures, and learn about the inner workings of the Bulgarian mind. Just look at the Mother-in-Law's Tongue a tongue-shaped stalactite with an unusually pointy end. The Giant's Wife, The Elephant, The Bathing Maiden, they are all there, waiting for you to discover them and see them with your own eyes. And when you have taken in all the beauty it is time to emerge from this fairytale underworld that keeps on expanding drop by drop as you read these lines. And unlike Orpheus you can turn back and have one last look before you go out, just in time to promise yourself you'd come back.